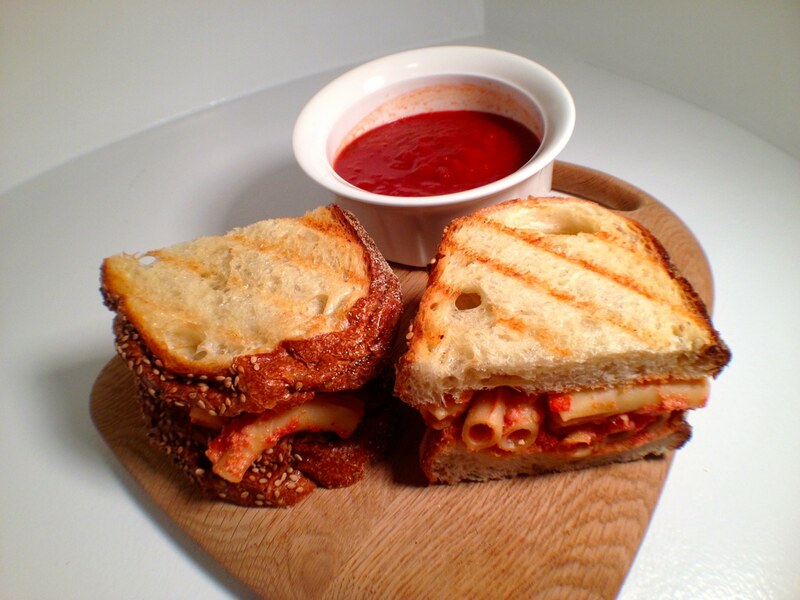 Here’s a great panini recipe to try the next time you have some leftover baked ziti. Left overs always make for great panini. In fact, I included a whole chapter of recipes for panini made with leftovers in my book (The Everything Panini Press Cookbook ). Now if I remember correctly, I think I put a spaghetti and meatball panini sandwich recipe in my book but today I’m making it with ziti. Ziti is a better bite sized pasta but really you can use any pasta variety that you’d like. The choice of bread is more important. You’re going to want something hearty and it should be sliced thick. Plain sliced bread will not hold up well with all the weight and moisture content of pasta and sauce. Go with Italian bread or a big ciabatta roll. Also if your leftover ziti is not baked ziti you can cheese it up with some mozzarella. The cheese is what helps this panini hold itself together. Plain ziti will taste good but will fall out of the sandwich. Put the ziti in a bowl, add a handful of mozzarella and mix it up. You can even give it a quick 30 seconds in the microwave if you like to get that cheese melting. Real baked ziti not only has mozzarella but ricotta cheese also. Add it to the bowl before mixing if you have some on hand. Another option would be to add meatballs. It really all depends on what you have leftover. But I’d cut the meatballs into bite sized pieces before adding them to the panini.